A few years ago, when Harper was just a wee little baby, I created my first sewing pattern while I was blogging as Ruthie Pearl. It was called "Baby Got Back Leggings" and was designed for tiny babies through two-year-olds wearing cloth diapers. At that time, I had an extremely hard time finding pants to fit over Harper's prefolds, and I couldn't find a pattern for knits (you know how I love knits!) that was designed specifically for this purpose. I guess you could say this pattern is what got me started on the pattern design route. I had this pattern for sale for a while on Craftsy and through my own site, but I took it down when I started learning more about pattern design and digital grading. I'm not really sure why because it's actually a really good pattern - especially for a first shot! But I am a perfectionist...what can I say. So today, I popped it open to take a look after about 2 years of not seeing it. And you know, it really IS a great pattern! But because my live files are long lost on an old and broken down computer, I can't update the original with my new blog title, branding, etc. So, I've decided to simply re-release it as a free download. It's done a little different than I do my patterns now (specifically, the tiling), but like I said, it's still a GREAT pattern that I used a million times when Harper was a baby. I'm sure you will get a ton of use out of it too! You can even use this pattern for non-cloth-diapered babies to create the super trendy drop-crotch look that's all over Pinterest these days. Faux fly template and instructions for making "jeggings"
Are you just a beginning sewist? Have you never sewn with knits? Have no fear! I fully illustrate exactly how to make the Baby Got Back pants with photos for every step along the way. You don't need any special equipment other than a sewing machine, and a serger is totally optional. 1/2 - 3/4 yard of stretch knit fabric like interlock, jersey, fleece, velour, etc. Thread, straight pins, scissors, marking pen/chalk - the usual sewing stuff! I didn't do a newborn size because I never really had much problem getting newborn or size 0-3mos size pants on Harper when she was tiny - even with her cloth diaper (she was average size - 7.5lbs and 20 inches). Remember, if you're used to buying pants two sizes too big for your baby to accommodate her cloth diaper, you don't have to do that with the Baby Got Back sewing pattern. 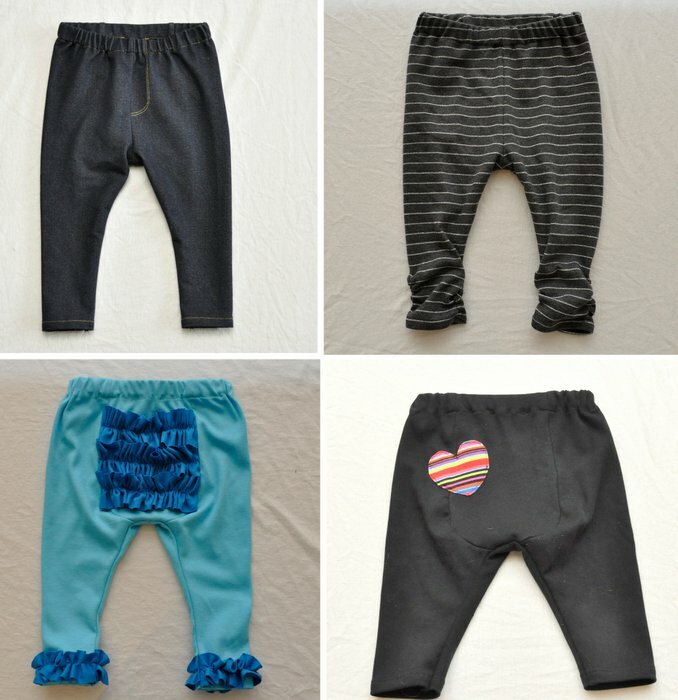 In fact, the pattern is sized pretty generously so babies at the top percentile range can still wear these pants (or babies at the top end of each age range - in other words, the 6-12mos size is designed to actually fit a 12-month-old). If in doubt when selecting your baby's size, go down a size! Or, if you want a nice-and-fitted legging look, go down a size. You can always grab an old t-shirt and whip up a sample pair to be sure about the fit before cutting into a more valuable fabric. Harper is shown in all these photos wearing the 6-12mos size. In the photos, she is 9-months-old, 19 pounds and 28 inches tall. She is in the 40th percentile for weight and the 70th for height. She could actually wear the 3-6mos size if I wanted a really fitted look. I like making her clothing a little big though so she has plenty of room to grow!